[By Nick] So if you live in the North East like Dubba and I, you've been experiencing a lot of below zero days as of late but that's not going to stop us from eating ice cream. 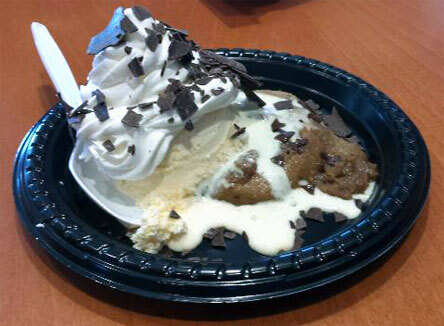 It seems like a good time to review something from Cold Stone's not-so new Hot Stone line. Thankfully I had a date with a pretty girl today that involved us going to Cold Stone. With the temperature barely in the positive range, I knew it was a perfect time to try out one of these creations. I'd like to apologize for the photos today. My phone died because I'm really good at charging it. I mean, as you can see it's already a hot mess after just receiving it. What we have here is a hard chocolate chip cookie that's covered with a mound of warm cookie dough like substance and then some french vanilla ice cream. As you can see, the ice cream was trying to get as far away from that warm cookie dough as possible. I honestly don't know how it got warmed up because my, ummm, ice cream artist?!? went into the back to get it. I'm going to go with a microwave for how fast she was. Not too long after my photo, this baby turned into a full on mess. The ice cream didn't stand a chance against the heat. If they wanted to prevent this, they should've swapped the cookie and cookie dough layers since the ice cream and cookie dough could then be separated as well as soften up the hard cookie a bit. Structurally, this isn't something you want to take to go unless you want a puddle before you get to you car. Thankfully, the flavors and textures worked perfectly. Their french vanilla was a lot better tasting that I thought. While it was more melted than I would've like, there was a rich egginess to it accompanied by a strong vanilla presence. The warm mound of cookie dough was obviously my favorite. It's essentially gooey cookie dough. Like if you put cookie dough in the oven for a few minutes so it's not still completely raw but still very malleable. It makes me wish I could find a way to make it a little more liquidy and make a thick syrup out of it. The chocolate cookie underneath was really unnecessary. It was hard and I had to put force into it to try breaking it down with my plastic spoon. This eventually led to a good portion of said cookie landing on the floor. Whipped topping and chocolate shavings are as you'd expect. There's not much I can say about them besides the chocolate being more like shards than shaving which is a good thing. There's also one more flaw of this dessert, it's tiny. Like way too tiny. I was done with it before my date was half way though her like it size Mud Pie Mojo. I'm not a slow eater by any means but there wasn't really much to it. For $5, this isn't much of a value to me. At least add two scoops of ice cream or something. Sure, this creation tasted good but this one had too much going against it for me to recommend a purchase. I'm still willing to try out more in the Hot Stone line though. Any suggestions? Notes: Hot Stone treats first appeared at Cold Stone in January 2012. Product image courtest of coldstonecreamery.com. I need science to find a way to make a chocolate chip cookie dough stuffed ice cream ball that you then bake. The cookies bake up nice and fresh inside while the ice cream ball stays frozen. Surely if anyone could do this, Science could. It would be like baked Alaska.